It’s a quiet, snowy Wednesday in Potsdam, and all of us have our heads down as we work against the clock — so much to accomplish before the students come back full-force! 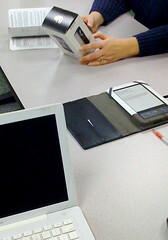 So it was particularly nice to spend an hour this morning watching the libraries’ staff fiddle with gadgets. One of my goals for this year was to establish a pattern and habit of having in-house professional development opportunities. So far, we’ve talked about how OCLC records weave their way through our work and who’s affected by which parts of the process, discussed performance evaluations, got a crash course in the demographics of our student body, and, this morning, had a petting zoo for gadgets. I intentionally waited until after Christmas to do this one — this is America, and we are nothing if not predictable about holiday consumerism — and lo and behold, there were new toys this month. 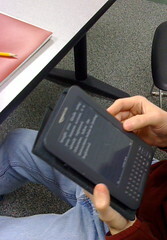 We had a netbook, two iPads, an iPod Touch, an iPhone, two Flip video cameras, a Galaxy tablet, a Kindle, and a Nook. 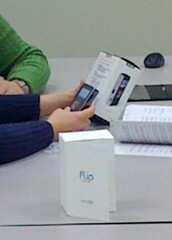 The best part, for me, was watching as we all tried to figure out unfamiliar user interfaces. Some were harder than others, some were harder for some than others, and some were easy once you realized what you were doing… all of which we learned by playing with the things. Picking them up, pushing the buttons, poking the screens, and swiping here, there, pinching that, what happens if I? Fun, and instructive. Learning by doing — or by watching over someone’s shoulder as they do it — is much more interesting and effective than reading about it on the internet. Library lovers as we all are, we ended up doing group pros-and-cons about e-readers and discussing the availability of free ebooks in public libraries. What can I say, it’s who we are. 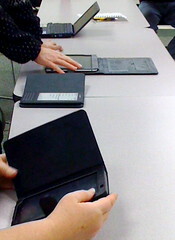 I would love the opportunity to play with all of those devices at once – the value in comparing their interfaces and sizes alone would be totally worth it, not to mention the informal, spontaneous discussions the devices would prompt between employees. I was just wondering how you justified making this happen in terms of finding the funds… I work at a state library in PA and would love to do something like this but making it happen is a completely different story. Love following your journey as a new library director upstate, by the way! I hail from Rochester, NY. Happy new year! That said, if I had a use case for each one from a staff member (I’m currently considering the best solution for a request for hand held devices for data entry of building use data gathered by walking around the libraries), and a sense that I should prioritize the funding, I would love to buy any of these things. technology is not a toy. Or, not ONLY a toy. Thanks for explaining, that makes a ton of sense. I plan on emailing my work colleagues to see if they have an interest in doing something similar. I figure between all of us we could at least gather a few of those devices. Thanks for the idea! Glad to oblige, and have fun!